The Echinoblog: Highlights from the recent NOAA Okeanos Explorer Samoa Expedition! 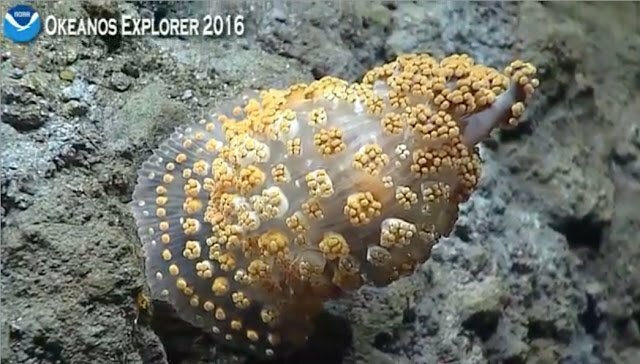 Highlights from the recent NOAA Okeanos Explorer Samoa Expedition! So, here is a nice highlight of various wonderful invertebrates observed by NOAA's deep-sea research vessel, the Okeanos Explorer which for all of 2016 and 2017 will be studying the massive marine reserves of American territory in the tropical Pacific! DON'T FORGET OKEANOS LIVE FEED RESUMES MARCH 7! But obviously, not everyone can watch EVERY day during the entire dive. So I present some cool highlights (but invertebrates) from the last leg of the research dive. My thanks to Santiago Herrera and Matthew Jackson the biology & geology science leads for this last epxpedition!! 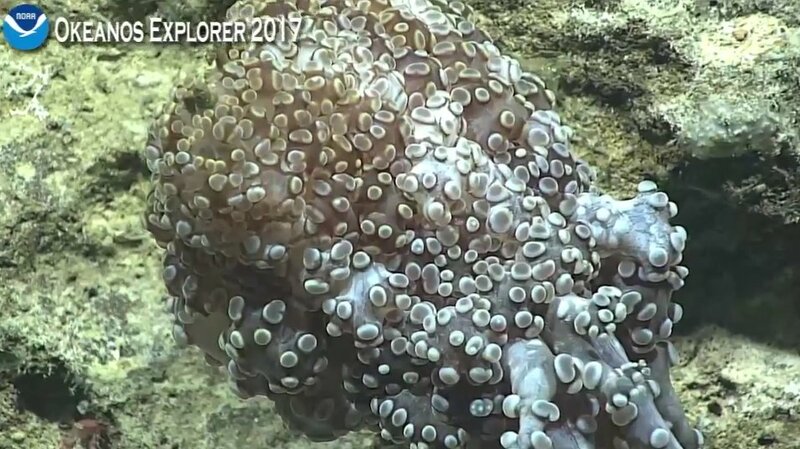 If you have missed it and are interested you can always go to Twitter and search for #Okeanos often with #Samoa or other similar terms. Also a reminder based on recent news about significant budget cuts to NOAA Remember that NOAA operates the Okeanos Explorer program!! 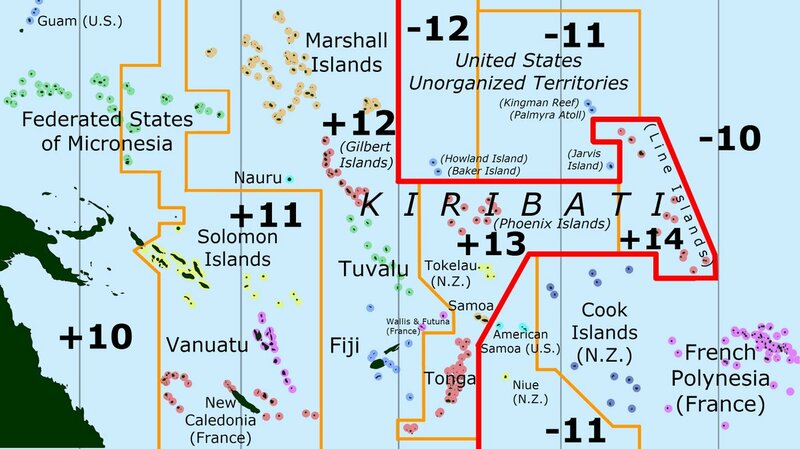 The oceans represent a HUGE unknown quantity and yet, we have no exploration arm to explore the amazing deeps of the Earth. Deep-sea News has made a GREAT argument about why we need an "Ocean NASA"! And right now, the closest thing NOAA gives us the closest thing to that! So, if you enjoy these and other images as well as the livestream RESEARCH and DISCOVERY please contact your congressional representative and LET THEM KNOW: DO NOT DEFUND NOAA. and now.. onto some cool beasts!! Most of what I'll present here are animals, but in the deep regions of the ocean, single-celled organisms that are basically HUGE amoebas can develop fairly LARGE structures out of sediment. I've written about them here. Some are called xenophyophores but it turns out that there's a fair diversity of them. Here's at least one structure observed on Utu Seamount at about 3030 meters! SPONGES!! 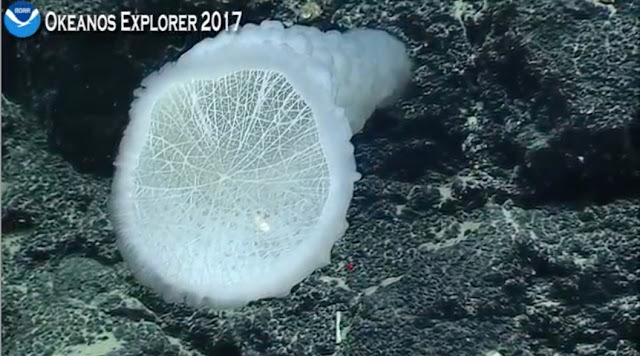 Some of the most commonly encountered animals on these Okeanos dives are sponges. Sponges are relatively simple animals that are basically big masses of cells but some of them use specific kinds of materials to create skeletons. Some use calcium carbonate, some use a fiber called spongin..and one group which is seen commonly in the deep-sea: glass or silicon dioxide. I've written posts about glass sponges before, here and a prior Okeanos cruise discovered what is probably the largest glass sponge known here. 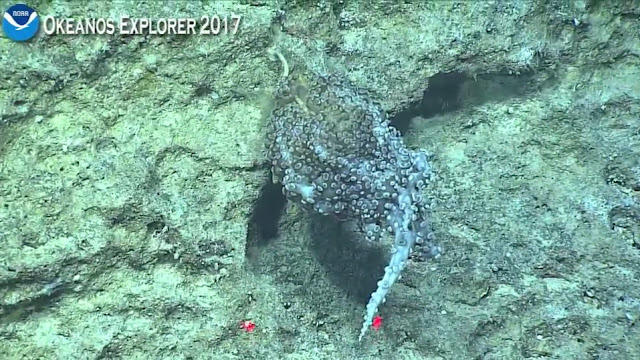 Here's a large one with a thick stalk and a large opening on the "head"
This is a cool one: this is a cladorhizid sponge. Many cladorhizid sponges are predatory and I think this one is as well..
those spines emerging off the edge makes it a deadly deep-sea umbrella! Here's another one from a different angel from Rose Atoll, about 2525 meters! 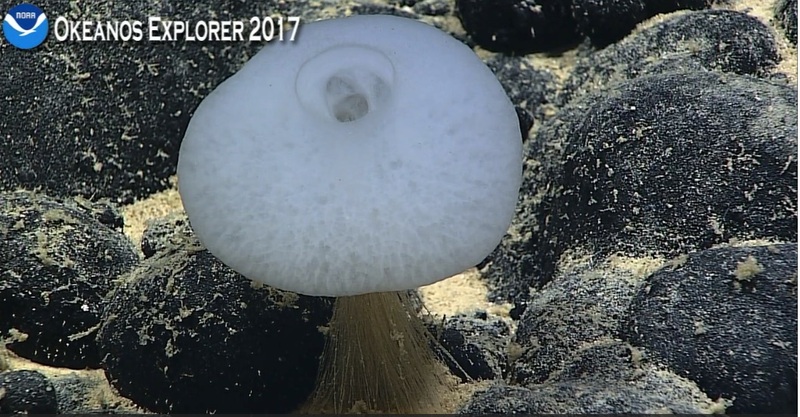 This is a glass sponge in the Euplectellidae, which is often identifiable by the unusual "cap" on the top of the sponge.. These are known for having 2 commensal male and female mated shrimps which do not escape from the internal cavity.. I missed the name/identification on this one..but I like to point out that those brown "roots" are actually GLASS. Glass sponges often seem to be growing "living" fiber optic cable and have been studied for their optical properties! Cnidarians are of course-those animals with stinging cells and radial symmetry. Jellyfish, sea anemones, hydras, hydroids and so on.They account for a huge diversity in deep-sea habitats! This "cosmic jellyfish" has been making the rounds. Its been identified as Benthocodon hyalinus by my colleague Allen Collins at NMFS. 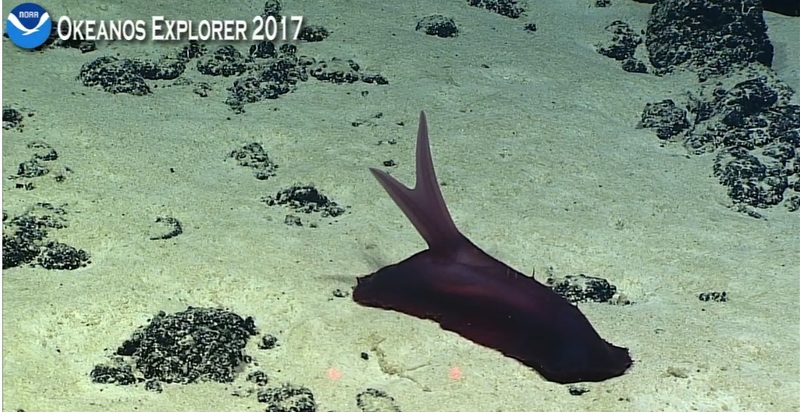 It was observed on Utu Seamount at about 3006 meters!! 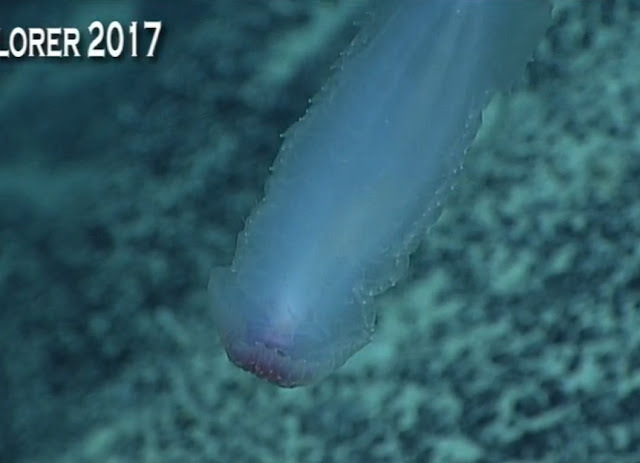 One of the most noteworthy of the cnidarians observed was this Dandelion or benthic siphonophore. Siphonophores are colonial animals which are mostly found swimming though the ocean in long chains which in some instances can be meters long! Familiar species include the painful Portuguese Man o War. 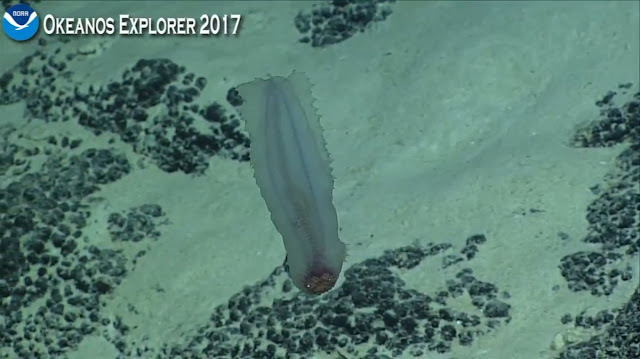 Similar in lifestyle-check out this tiny bottom living (aka benthic) ctenophore (or comb jelly). I've discussed these at length before here. Again, most comb jellies swim-but then you get these oddballs that have an active bottom life using their long tentacles to capture prey. 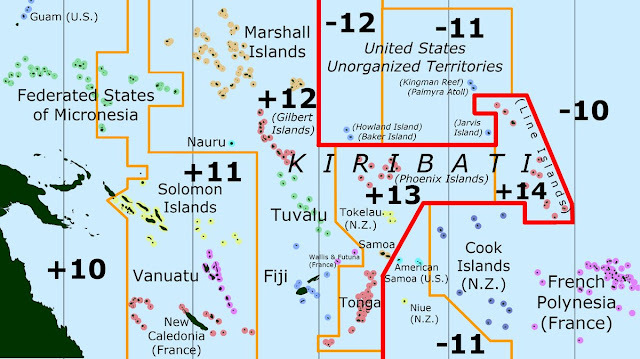 It turns out we saw one of these during the Marianas expedition LAST year! Which makes the one above a likely DIFFERENT species from the other one we saw which had yellow buttons rather than white ones..
Unsurprisingly, some of the most exciting observations on this last cruise were MOLLUSKS! We don't normally see a lot of snails or clams on these cruises..but we made up for it on this dive! Few animals that I know of have what might be considered "holy grail" status. THIS is one of them.. In this case, the mysterious mollusk known as Neopilina! This mysterious mollusk has previously been collected from abyssal and ultrabyssal depths between 4000 and 6000 meters. From both the Atlantic and the Pacific. These are rarely collected and in the past were perceived as being VERY important to evolutionary or other ecological studies. Basically these animals were regarded as ancient AND ancestral mollusks-the "Ur mollusk" if you will. They inspired a LOT of questions about what they were related to and how other mollusks were related to one another.. But I think this might be the FIRST time an in situ (in place and ALIVE) observation has been made! I admit that this tiny brown limpet thing does not have the same... presence as say some giant octopus or squid, but once you know all the history behind it.. well, I say this with no irony-seeing it alive in its habitat was HISTORIC!! 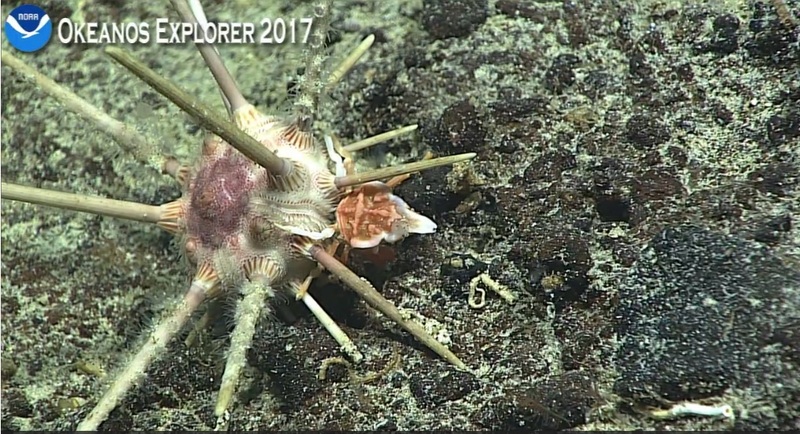 ROV scoop flipped one of these critters over & iIndividual gills (arrows) mean MONOPLACOPHORAN! Octopus! So, of course we are always fond of cephalopods when they turn up! 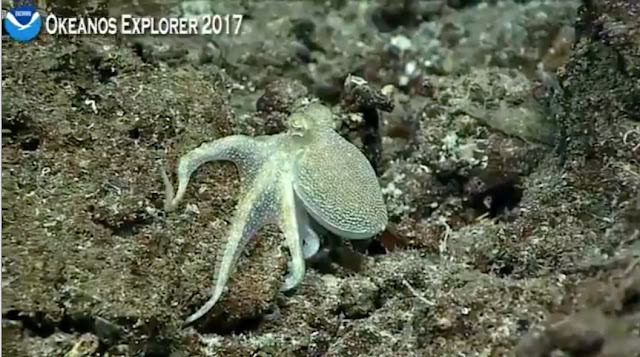 This white translucent octopus species was observed at least twice on the dive at relatively "shallow" depths between 380 and 400 m. This first shot was from Tau seamount. Note that the webs of skin between the arms were translucent! This one was seen at Rose Atoll at about 393 m and it was investigating a series of little holes and caves.. presumably looking for food.. ECHINODERMS!! So, where MY group is concerned I'm always a little biased and have more imagery than of other groups (not as many corals for example). And because I work on starfishes-there's enough pics that I will get to those in another post! This funny beast which I think was in the Deimatidae? 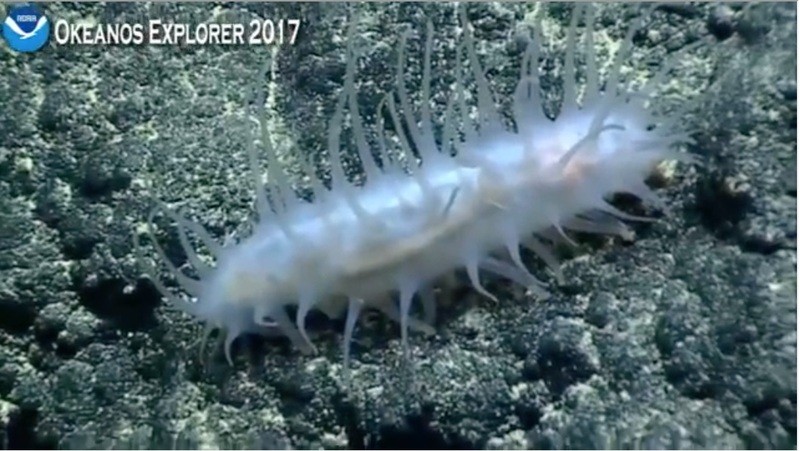 Note that as with many deep-sea sea cucumbers, the body wall was translucent and we can see the sediment eaten by the animal THROUGH the body wall! The bizarre semi-swimming sea cucumber Psychropotes I blogged about this genus of sea cucumber and the number of species there might in the world oceans! This sea cucumber (Paelopatides?) in free swim glide! Moki Seamount about 2083 m WHEEEE! A sea urchin the family Pedinidae I think? Lovely greenish coloration! 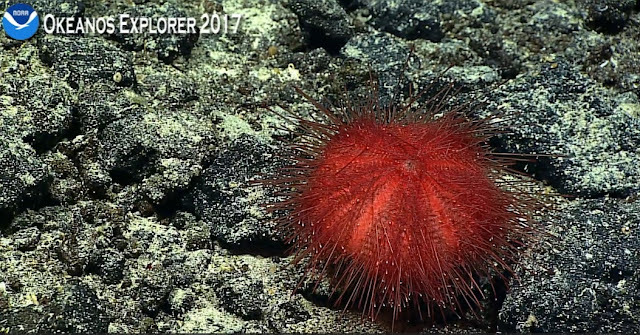 A reddish.. echinothuriid urchin? Aka a "pancake" or "tam o shanter" urchin. I've written about these before here. We saw a few different species of these kinds of urchins. But they are difficult to ID from pictures..
MIXED TAXON CRAB + COMBINATION!! 2. Zoanthid "anemone" PLUS hermit crab! A relationship that has been seen before but no less weird whenever we see it. Basically a sea anemone-like animal called a zoanthid rides and replaces the shell that this hermit crab would normally be wearing.. The crab benefits from the protection and the zoanthid gets driven around by the crab for dispersion, food, etc.. Interesting commensalism! Here's a nice one seen back in 2015 by Diva Amon!